This article describes how there are specific tools and techniques used by teachers in synchronous-live-virtual classroom environments. Those items were investigated in this article. 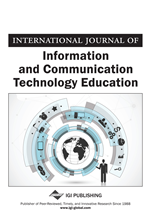 Data was collected from semi-structured, one-on-one interviews conducted with a purposeful sample of twelve identified “highly-qualified” teachers at a cyber charter school in Pennsylvania that administered mandatory online synchronous class sessions. Additional data was collected through observations of each participant in their recorded archived “synchronous live” class sessions. The results of the study detailed the use of tools and techniques in regard to engagement, assessment and classroom management. The research on synchronous education is limited, with the majority of the research on student satisfaction and the retention of students with a focus on higher education (Lim, 2010; Moallem, 2006; Meyers & Schiltz, 2012). There is little focus on the tools and techniques used within the synchronous virtual environment. As online education grows and technologies advance, virtual classrooms have evolved, creating an environment that have students actively learning and interacting by doing and building new knowledge (Johnston, Killion & Omomen, 2005; Palloff & Pratt, 2003). Rice (2012) believes that in any educational environment there is some transactional distance, even in the traditional environment (p. 75). Transactional Distance Theory is based on the idea that the physical separation of the learner and instruction can lead to psychological and communication gaps that create misunderstandings and feelings of isolation (Moore, 1997). These gaps of understanding and communication between teachers and students caused by geographical distance need to be closed, or decreased. It is important for virtual teachers to understand transactional distance theory and how the students connect with others in the course (Stein, Wanstreet, & Calvin, 2009). One way to close the gap is through examining the community of inquiry (COI) framework (Garrison & Arbaugh, 2007), creating a deep and meaningful learning experience through the constructs of teacher presence, cognitive presence, and social presence. Another way is examining how to create a voice for learning, connecting in a space for learning and creating a time for learning (Stein et al., 2009; Watson, 2007).